This is a 3/4 size replica of the statue created by sculptor Toru Komuro who was from Shibata-machi that was erected at Sendai castle (Aoba Castle). This is located at the lobby of the Shibata-machi rural environment improvement center, and can be viewed freely. You can only see the statue from below at the Aoba Castle but here at the improvement center you can see it from the side, or from the top from going up the stairs beside it. After graduating as the head of the class from the Tokyo School of Fine Arts, he established his position in the art world of Japan at the young age of 27. 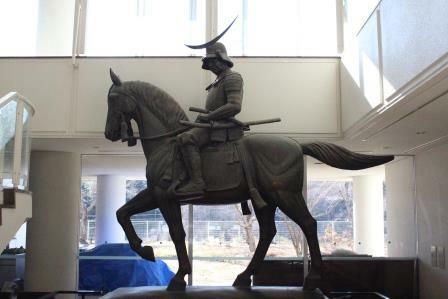 As a commemoration of Date Masamune's 300th anniversary since his death in 1935, he created the bronze statue and it was installed at Aoba Castle. He passed away on June 18, 1953, at 58 years of age from pulmonary tuberculosis.